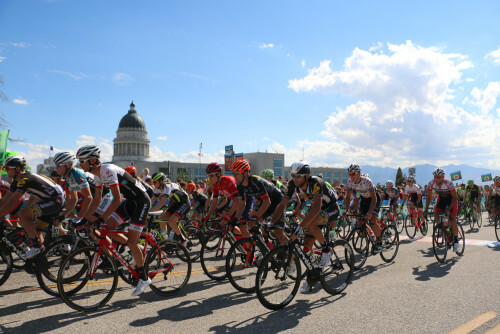 SALT LAKE CITY (March 9, 2016) – Twelve of the world’s best international and domestic men’s professional cycling teams have accepted invitations to compete at the Larry H. Miller Tour of Utah, Aug. 1-7, 2016. Four of these squads are UCI WorldTour teams, having finished in the Top 12 at last year’s Tour de France. Two teams are racing the Tour of Utah for the first time, including Switzerland’s IAM Cycling from the WorldTour ranks. Of the 10 men’s teams returning to battle at “America’s Toughest Stage Race,” these teams have accounted for 18 stage wins at the Tour of Utah since 2011, the year the Tour became sanctioned by the Union Cycliste Internationale (UCI). Four additional teams will be announced later this spring, with race rosters for Utah anticipated in July. Look for at least three Utah riders to participate – Tanner Putt of UnitedHealthcare Pro Cycling, Chris Putt of Jelly Belly Cycling, and Robbie Squire of Holowesko|Citadel Racing. “It’s an honor to have such a prestigious field of teams confirmed early in the year for the Tour of Utah. We hear so much positive feedback from teams around the world about the welcoming host venues, stunning scenery and competitive courses in Utah. We look forward to announcing the final field of 16 competitive teams for a great week of racing in August,” said Jenn Andrs, executive director of the Larry H. Miller Tour of Utah. The Swiss-based IAM Cycling makes its inaugural appearance at the Tour of Utah. In just its second appearance at the Tour de France last year, IAM Cycling finished ninth overall in the team classification. Returning for a third time to Utah is Trek-Segafredo (USA). Finishing fifth overall last year in the Team Classification, the team was led by Fränk Schleck (LUX), who finished fourth on General Classification at last year’s Tour of Utah. BMC Racing Team and Cannondale Pro Cycling Team, both based in the U.S., return to the Tour of Utah for their eighth and seventh years, respectively. BMC Racing Team, second in the team standings in Utah last year, captured four podium spots during race week. American Brent Bookwalter won the overall Sprint Classification for BMC Racing and was third on G.C. Cannondale Pro Cycling had two riders on the podium during race week, with American Joe Dombrowski winning Stage 6 and the overall G.C. title. The two Pro Continental teams each make return appearances to Utah. American-based Team Novo Nordisk returns for a sixth time (the team competed four times as Team Type 1), and UnitedHealthcare Pro Cycling Team, also based in the U.S., returns for a record 10th edition. UnitedHealthcare Pro Cycling captured two podiums at last year’s Tour of Utah. All six Continental teams are based in the United States, with the Lupus Racing Team making its first appearance. The second-year Continental team features American veteran Chris Horner, who finished fifth on G.C. at last year’s Tour of Utah, and was the G.C. runner-up in 2013 and 2014. The two top-rated teams on USA Cycling’s 2015 National Racing Calendar return to Utah, and with new names. Holowesko l Citadel Racing Team presented by Hincapie Sportswear, ranked No. 1 as Hincapie Racing Team, finished fourth overall in the Team Classification last year in Utah. Rally Cycling, ranked No. 2 as Team Optum presented by Kelly Benefit Strategies, had two stage victories last summer. Team Optum has raced the most often in Utah of all the Continental teams, with this year being its eighth edition. This is the seventh year in Utah for Jelly Belly Cycling presented by Maxxis and Axeon Hagens Berman Cycling Team (formerly Trek-Livestrong, Bontrager and Bissell Development). Team Jamis returns for a fifth year. Axeon Hagens Berman Cycling Team was the only Continental team to register a stage win at last year’s Tour of Utah, with Logan Owen taking Stage 3. Entering a second year as a UCI 2.HC men’s stage race, the Tour of Utah is one of the top two events on the America Tour for the international governing body of cycling. An attendance record was set in 2015 with 380,000 spectators over the seven days of racing. The event was the only stage race in North America to feature start-to-finish live webcasting, viewed by users from 139 countries. More than 21 hours of national television coverage was provided by FOX Sports and FOX Sports Networks, including 14 hours of live racing.